​Lustration of the Ancestors Silent Auction! We are pleased to present to all members and friends of the Correllian Nativist Tradition an eclectic group of merchandise donated to help provide financial support to CNT. Our heartfelt thanks go out to the individuals who have provided items for this event. Winning bidders will be notified by April 25, 2019 by email and final results updated to the webpage. ​How To Bid - It’s Easy!! ​Upon receipt of your bid, you will be assigned a bidder ID and a confirmation will be sent back to you, letting you know the results of the bid. If you are outbid at a later date, you will be advised via email to allow you to submit a re-bid(s) or bid on something else. Indigo Angel Oracle Cards by Doreen Virtue and Charles Virtue. From the back of the box: Each of the 44 beautifully illustrated cards contains a special message from the angels. The accompanying guidebook explains the meanings in a way that is simple and to the point. This boxed set includes 44 Cards and Guidebook in lightly used condition. to edit. Here we have from our First Priestesses broom closet, a metal encased glass potion bottle with a faceted screw on top with a metal rod attached for applying your own magical mixture. [New / Unused] The metal surrounding the bottle and at the base depicts the sun and the stars. The bottle measures approx. 4” tall X 2 ¼” at widest point. This is a black fleece zipper front jacket with the Correllium and Correllian Nativist Church written above. Modeled by the donor’s daughter – Rachael, it is a size medium and was created in advance of the 2018 Parliament of World Religion, Toronto, Canada. This jacket is new and ready to keep you warm when “winter comes”. 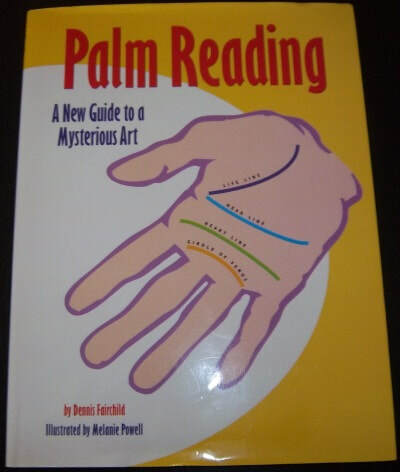 Palm Reading – A New Guide to a Mysterious Art by Dennis Fairchild, Illustrated by Melanie Powell. 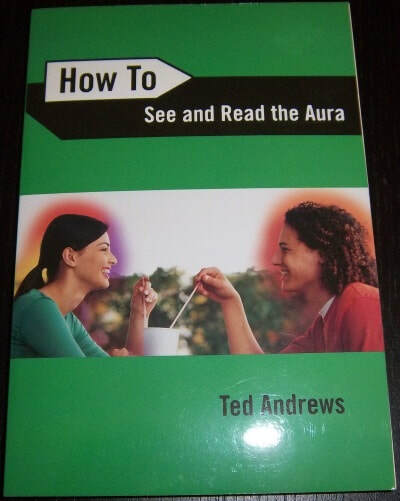 From the rear cover: A comprehensive, fully illustrated guide to modern palm reading by a professional palmist. Contains detailed information on major and minor lines; shapes of hands, thumbs, fingerprint analysis; and more. This is an oversized 9 1/2” X 12” hardback book with dust jacket [80 pages] in like new condition. Here we have a tree depicting the colors of nature encased in a clear glass cover surrounded by silver tone metal and a 18” matching chain. The pendant is approx. 1” round. Celebrate your earth spirit with this necklace. These pierced earrings were designed by Courtney Davis and created exclusively for Peter Stone Jewelry Makers. They are Sterling Silver and the winged dragons’ measure approx. 5/8” X ¾” suspended from standard elongated loop finding – New on Card. 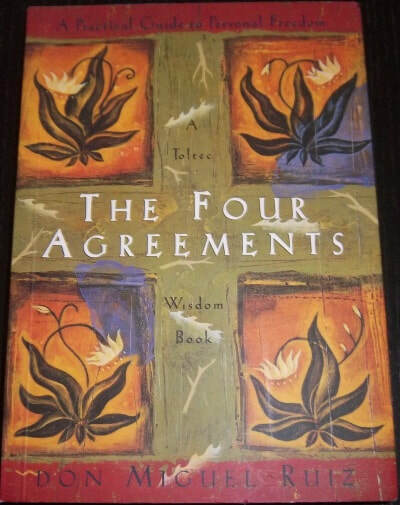 The Four Agreements by Don Miguel Ruiz. A Toltec Wisdom Book A Practical Guide to Personal Freedom. From the back cover: In the Four Agreements, Don Miguel Ruiz reveals the source of self-limiting beliefs that rob us of joy and create needless suffering. Based on ancient Toltec wisdom, the book offers a powerful code of conduct that can rapidly transform our lives to new experiences of freedom, true happiness, and love. This is a smaller (5” X 7 ¼”) softcover book ($12.95) in like new condition. 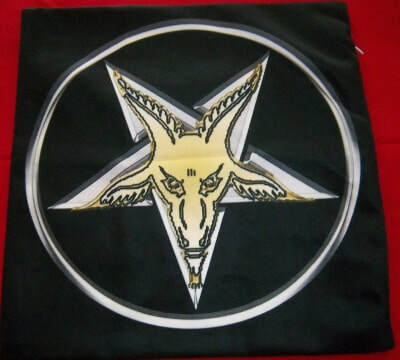 This is a small decorative Dragon / Stylized Pentacle design pillowcase ready to be filled with your favorite cushion material. The design set against a black background, will add a decorative touch to your sofa, chair or bed. The unfilled zipper closure pillowcase measures 12” square with the same design on both sides. New - unused. From jewelry maker, Mitra. A pair of earrings she has titled “Fiesta.” Combining a silver tone flower design, round turquoise and square smokey quartz beads and silver accents, they transform into a beautiful pair of earrings. These would be ideal for the belly dancer in you! They measure 3 ¼” at longest point and ¾” wide. This item is new, removed from the packaging to take a picture. See additional pieces by this jewelry artist further down as well as a few more pieces will be available at the in-person auction. Witch Hunt – Mysteries of the Salem Witch Trials by Marc Aronson. From the inside DJ flap: The author sifts through the facts, myths, and half-truths, misinterpretations and theories around the Salem Witch trials to present you with a vivid narrative of one of the most compelling mysteries in American History. This is an ex-library hardback book ($18.95) in very good, possibly unread condition. Note, normal library and barcode stickers on the protective DJ Mylar cover and DJ flaps tacked down. How about a little “Bling” on the wrist. Here we have a rhinestone encrusted bangle bracelet with clear rhinestones set against an aqua green background with a bead edging on both sides. The interior appears to be silver plate. The outer diameter is 3” and 2 ½” inside. 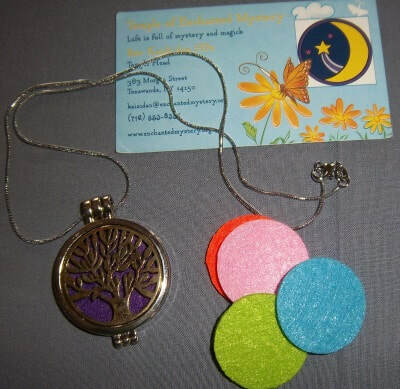 Dream Beads, the concept created by Lady Stephanie helps one to re-examine our daily dreams as you meditate. 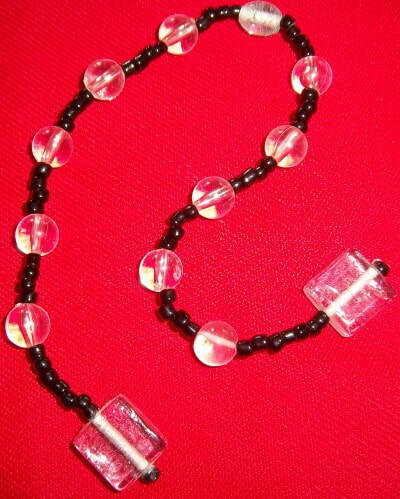 Hand beaded by the donor using clear beads spaced with small black beads and ends with clear square glass beads. Approx. 12” long. Instructions on their use will be included. 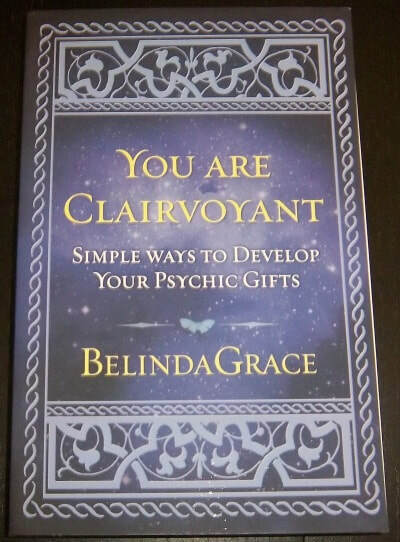 You are Clairvoyant – Simple Ways to Develop Your Psychic Gifts by Belinda Grace. 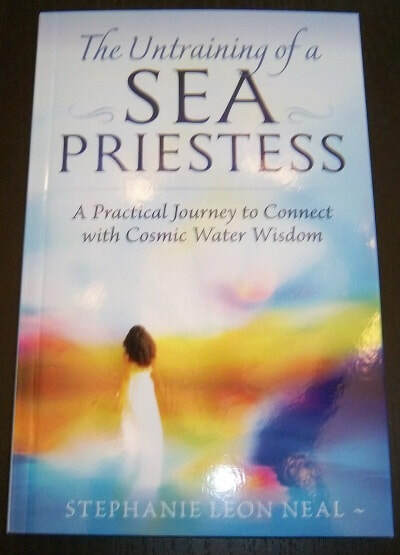 From the rear cover: Connect with both divine guidance and your inner wisdom by following the simple techniques in this book. You already are clairvoyant – you simply need to learn how to activate this powerful skill and then use it to create greater happiness and fulfillment. This is a smaller sized softcover book ($14.95) in like new condition. Angel Prayers Oracle Cards by Kyle Gray. From the back: This deck is a powerful spiritual tool that allows you to tap into the profound wisdom and healing support of the angels in a way that will feel real and positive. 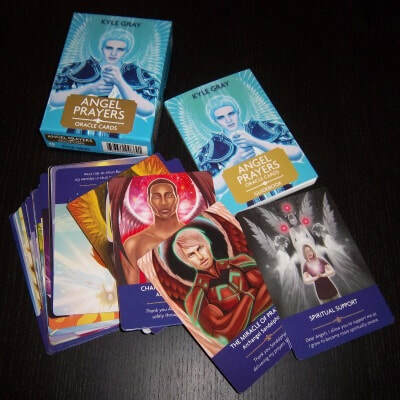 Full of loving messages from the angels, archangels and even the Divine Mother and Divine Father, each card offers you a powerful affirmative prayer which will help you to resolve specific situations in your life for the highest good. This is a very nice boxed set ($15.95) in like new condition having a 44 card deck and Guidebook. 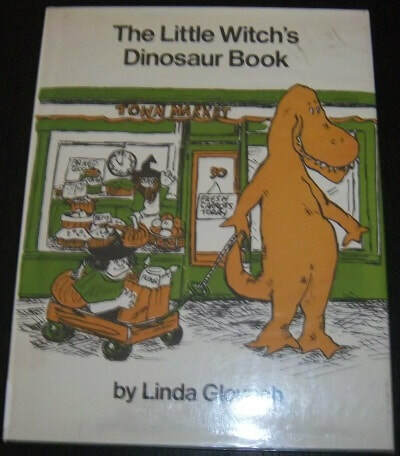 Yule – The Little Witch’s Dinosaur Book by Linda Glovach. This title is one of many in a “Little Witch” Series. So whether Mom or Dad, Grand Ma or Pa, Aunt or Uncle, here is something to bring home for the little ones in your family. This ex-library book is in very good condition with normal ex-library accruements. Hardback ($8.95) with 48 pages and DJ covered with a protective cover and DJ flaps tacked down. 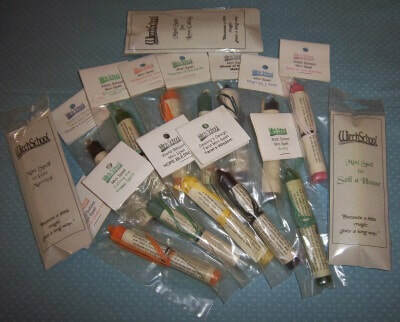 Up for auction is a lot of 15 Mini-Spells. From the early days of Witch School, these were a staple in the Store. These came from an anonymous donor a few years ago, with this last lot held for that extra special celebration. This year marks that event as we celebrate and honor our Chancellor’s Ruby Anniversary. All packaged and blessed as originally assembled with just 2 duplicate spells. Here we have a cut stone pendulum in beautiful earth tones and striations suspended from a silver tone metal chain and a reticulated stylized heart charm at the other end. This is new and comes with a black mesh drawstring bag. Here we have a potion to ward off anxiety. This potion was made during a workshop led by Deej in which multiple ingredients were blessed and placed into this glass jar. (the “recipe” will be emailed to the winning bidder). Should you experience anxiety, hold the bottle in both hands and visualize all anxiety draining from your body into the sealed glass tube. To recharge, place the container out under the next full moon. The glass tube measures 3 ¾” tall and 1” diameter is sealed with candle wax, burned during the making of this potion. Circle of Isis – Ancient Egyptian Magic for Modern Witches by Ellen Cannon Reed. From the back cover: Based on over 25 years of work with the deities of ancient Egypt, this book shows how the author, her coven, and her friends have come to know these Gods and Goddesses and how this knowledge has enriched their lives. Included are meditations and techniques to bring those deities into your life and enrich your path. This is a softcover book ($15.99) in very good condition. Rev. Ser Lori Blackman, Lady of Light proto-Temple. What could be more balancing then to adorn your neck with this white owl set against a full moon night, to bring forth wisdom each day. The design set under a glass cabochon, encased in an antique brass metal with a matching 18” chain. This is new and the pendant measures a little over 1” in diameter. 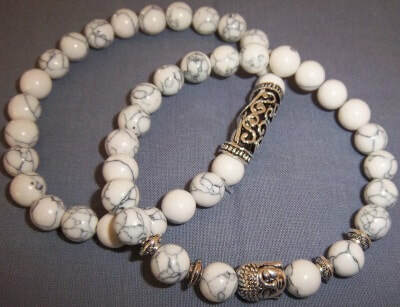 Here we have a pair of natural stone (white with veining) with silver tone Buddha / Reticulated metal beads. The pair are strung with elastic cord to easily stretch over you and your partner's hands. This pair of bracelets are new. Titled “Sweetheart” by the jewelry maker this pair of earrings is made of silver tone metal with a deep green marble like bead from which the reticulated hearts are suspended. For pierced ears and measure approx. 1 ½” below the finding. – New on card. 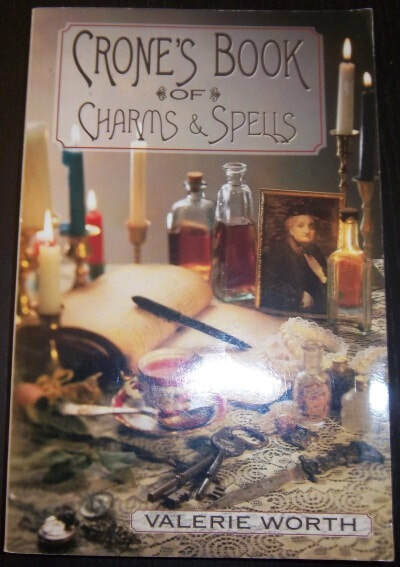 Crone’s Book of Charms & Spells by Valerie Worth. From the back cover – Here shall be told the secrets of a crone greatly skilled in the ways of mysterious charms, chanting spells and ancient incantations, spiritual philtres and elixirs, simmering brews of fresh-plucked herbs, fair amulets and magical rings, and all arts of the wise… This is a smaller (5 ¼” X 8”) softcover book in very good condition. This is a stenciled on black canvas type material on which to lay a card spread when reading Tarot. 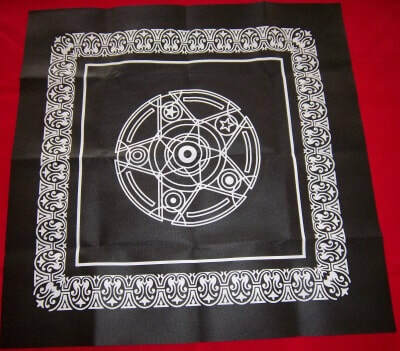 The center design is a stylized pentacle within a pentacle. The canvas cloth measures 19” square and will be refolded for mailing, so a light ironing to remove the fold creases will be needed upon receipt. This is a 7 chakra natural stone ring set in a silver tone metal setting. Consider the energy both received and sent when this graces your finger during ritual or everyday wear. The ring is adjustable and new / unworn. Va-Va-Voodoo, Find Love, Make Love & Keep Love by Kathleen Charlotte. From the back cover – With its emphasis on love and freedom, the passionate spiritual practice of Voodoo has much to offer those seeking romance. In Va-Va-Voodoo, the author provides a unique and potent blend of Voodoo magic (or wanga) and relationship expertise. You will meet a few of Voodoo’s most helpful spirits in matters of love and happiness. This softcover book ($14.95) is 7” square in excellent used condition. This is an exquisite Tree of Life design cast in a silver tone metal with black antiquing in the roots, branches as well as the spiral trunk. It has a very nice weight and the design is duplicated on the reverse side. The pendant measures approx. 1 3/8” diameter and comes with a ball link 24” chain that can be easily sized down. Item removed from original packaging (New) to take a picture and is now in a mesh bag. The Spirit Whisperer – Chronicles of a Medium by John Holland. From the back cover- This work chronicles his career to date and includes some enlightening and heartfelt real life case studies. He candidly discusses readings with clients, including those who have had their own After Death Communications (ADCs) – from the outrageous to the profound. He also explains the signs and symbols that our loved ones continually try to send us. This is a softcover book in gently used condition. 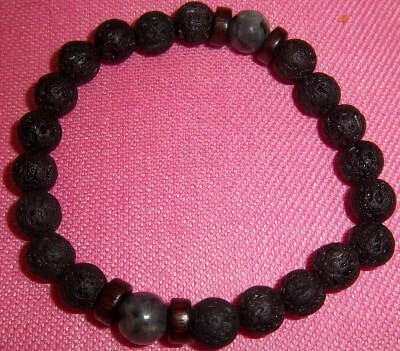 Here we have a natural lava and stone bead bracelet strung with elastic cord for easy wearing. Imagine the substance of lava, coming up from within the earth, red hot and then cooling – trapping all that energy within. The bracelet also acts as a diffuser by applying small amounts of your favorite oil to add to what it already is! This piece is new. This pendant depicts a fairy, looking into the face of a crescent moon. The image is set behind a glass cabochon set in black metal with a matching 22” chain that can be shortened with the lobster claw closure. Pendant is New. 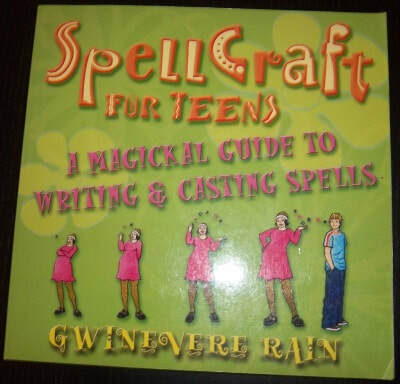 Spellcraft for Teens – A Magical Guide to Writing & Casting Spells by Gwinevere Rain. 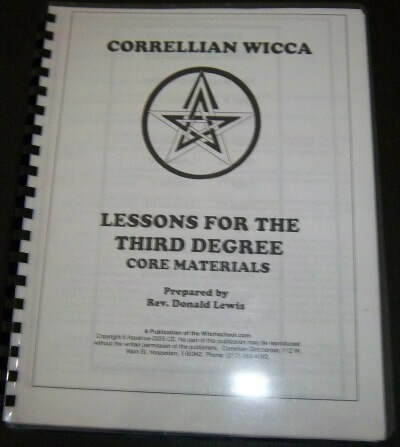 From the back cover – In this book you’ll discover that Wicca – the nature based religion also known as the craft – isn’t hocus-pocus. 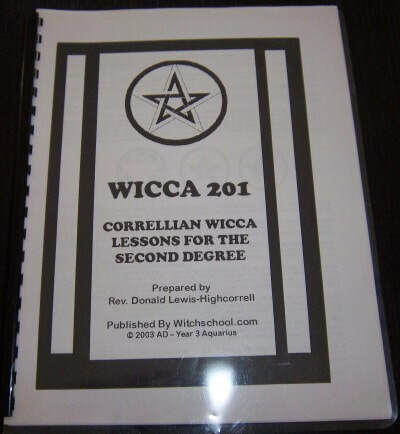 In addition to learning how to cast a spell for bewitching beauty or psychic powers, you’ll learn what Wicca is and what it isn’t - what Wiccans believe about the Goddess and God, and the Witch’s special days of power. This is a used softcover book ($12.95) in excellent condition. 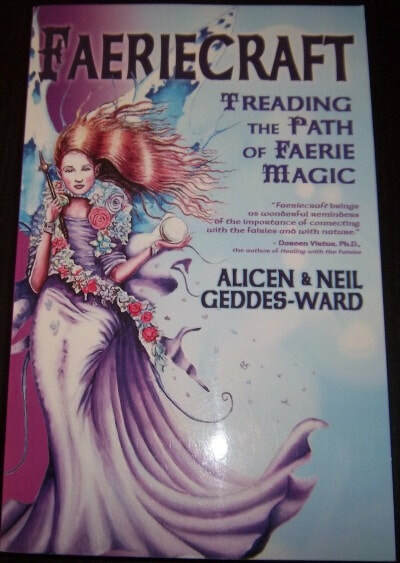 Faeriecraft – Treading the Path of Faerie Magic by Alicen & Neil Geddes-Ward. From the back cover – Faeriecraft is the creative melding of the faerie faith and natural witchcraft. The Faerie world has traditionally remained a mysterious and allusive secret, but the authors have worked with this realm for many years and passionately believe that the faeries will make themselves available to anyone who truly seeks them. This is a softcover book ($14.95) in as new condition.